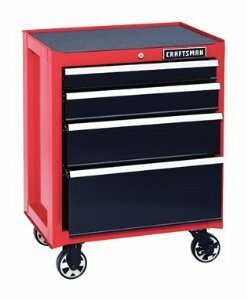 If you are in dire need of a new tool cabinet for your garage or shop, you should read out this Craftsman Cabinet review. This may not be the biggest or fanciest tool cabinet, but it is effective and does its job just fine. Besides the locking mechanism which some people have called flimsy, everything about the Craftsman 4 Drawer Rolling Tool Cabinet is very durable and built to last. In terms of value, you do get a big bang for your buck. It’s not the cheapest cabinet and doesn’t have the most features, but still quite a solid buy. Besides the fact that there is no good place to organize large sets of small tools, the Craftsman 4 Drawer Rolling Tool Cabinet definitely has lots of storage space. The Craftsman 4 Drawer Rolling Tool Cabinet is not built to be portable. It’s a stationary cabinet as far as offsite jobs go, but it does have wheels to move around within the shop. This particular tool cabinet courtesy of Craftsman is a really useful tool storage cabinet that you can keep in your garage or shop. It is a big and heavy tool cabinet, so you won’t be taking it with you on the go. However, it does have wheels, so moving it around the shop is no difficult task. It comes complete with 2 large drawers and 2 medium drawers for a whole lot of storage capacity. It also comes with a lined top that can be used as a workspace, plus you can place a Craftsman tool chest on top too if you so choose. The Craftsman 4 Drawer Rolling Tool Cabinet is a perfect choice for anybody who works from home. Whether you work on cars, computers, do woodworking, electrical work, or are just a home hobbyist, this is a great option for storing all of your tools. It is not exactly portable, so it is not really for people who want to take their tools to the jobsite, but for anybody working at home or dedicated shop, the Craftsman 4 Drawer Rolling Tool Cabinet is definitely a great option to keep in mind. In all reality, what is in the box here is fairly simple and straightforward. It is a 4 drawer rolling tool cabinet, complete with 2 large drawers, 2 medium drawers, and some space on top too. It comes in at 21 x 29.5 x 32.8 inches and weighs just under 100 pounds. This is a solid steel tool cabinet with a nice powder coat finish for a whole lot of durability. It features wheels for some portability, plus they can lock so the Craftsman 4 Drawer Rolling Tool Cabinet does not move around. The drawers are very strong and rest on smooth glide ball bearing rollers. You can even lock this thing, which is a big bonus no doubt. To be fair, the Craftsman 4 Drawer Rolling Tool Cabinet is a very simple tool cabinet and really does not have that many features, but it does have a few worth mentioning. The fact that this bad boy is made of steel is something that we definitely like. Sometimes there is just nothing better and more durable than good old steel. In fact, the Craftsman 4 Drawer Rolling Tool Cabinet has a weight capacity of 650 pounds, which is very impressive to say the very least. 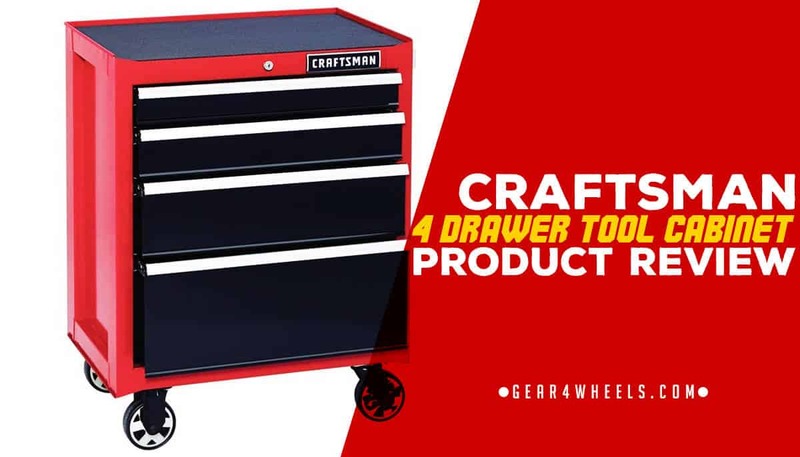 The Craftsman 4 Drawer Rolling Tool Cabinet comes with 4 wheels, so you can easily roll it around your shop. At the same time, the wheels come with a simple locking mechanism so that the cabinet does not roll by itself all over the shop. Speaking of locks, we do really like how you can lock the drawers of the Craftsman 4 Drawer Rolling Tool Cabinet with a key. Nobody is going to be stealing your tools if you keep them inside of this thing. As for the drawers, there are 2 large bottom ones and 2 medium ones on top. It provides you with more than enough space for all of your medium sized power tools and all other kinds of tools too. The drawers are on smooth glide rollers too, which helps make life a little easier. Like we said, the Craftsman 4 Drawer Rolling Tool Cabinet is a very simple tool cabinet, but very effective, durable, and useful too. Heck, if you have the Craftsman tool chest, you can even place it flush on top of this cabinet. The Craftsman 4 Drawer Rolling Tool Cabinet is one of the better heavy duty rolling tool cabinets out there. It’s durable, it has plenty of room, and makes for the perfect option for any garage or workshop.